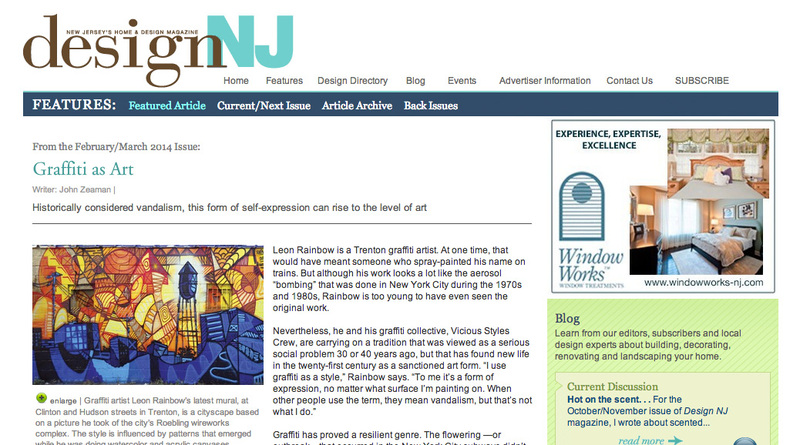 Leon Rainbow is a Trenton graffiti artist. At one time, that would have meant someone who spray-painted his name on trains. But although his work looks a lot like the aerosol “bombing” that was done in New York City during the 1970s and 1980s, Rainbow is too young to have even seen the original work. Graffiti has proved a resilient genre. The flowering —or outbreak—that occurred in the New York City subways didn’t come out of nowhere. The New York writers picked up on a Philadelphia style from the 1960s, in particular the graffiti of a writer who used the tag CORNBREAD. In the 1950s, there were the Charlie Parker fans writing “Bird Lives!” and before them the 1940s GIs who wrote the victory slogan “Kilroy was here” on buildings in Europe. In fact, graffiti goes all the way back to the ancient world and the Italian word graffiato, meaning “scratched.” Back then, writers etched their self-advertisements or messages into the soft sandstone surfaces of buildings and catacombs. Some have made the case that the earliest art of all—prehistoric cave paintings—were graffiti, although it’s unclear that anyone owned those cave walls. For most of its history, graffiti has been defined as an unauthorized activity. If you made graffiti, you were a vandal. Modern graffiti was made possible by the mid-twentieth-century invention of the aerosol spray can. Aerosol made graffiti incredibly easy: Just push the button. The effects were flashy. The number of colors endless. And unlike chalk, it didn’t wash off. If you were in New York City during the ’70s and ’80s, you couldn’t avoid seeing graffiti. Subway trains rolled into the station like moving billboards, their sides covered with spray-painted giant 3-D or bubble letters spelling out a tag like SKEME or PISTOL 1. Elaborate projects like these couldn’t be done quickly, even with spray cans. They required preliminary drawings and usually were done in train yards at night or over a weekend. The insides of the cars were the province of the less-disciplined, more-hurried writers who, with marker pens, created a hellish wallpaper in that crowded, vaguely Arabic-looking script that is graffiti convention. Despite admiring intellectuals such as writer Norman Mailer, subway riders generally hated graffiti. Half the time, the graphics were so convoluted the uninitiated couldn’t even decipher them. Which didn’t bother the writers, who said they were “bombing” for each other, not the public. The tags were expressions of bravado and territorial marking. The competitiveness inevitably led to graffiti artists writing over each other’s tags, in effect vandalizing the work of other vandals. By the late 1980s, increased security, tougher penalties and new methods of cleaning and repainting cars brought an end to most subway graffiti. But books, magazines, films and websites have kept those wild days alive for subsequent generations. Leon Rainbow, who is half Native American, cites the 1983 documentary “Style Wars,” which he watched as a very young boy, as a major influence. “I wasn’t drawn so much by the taboo nature of it as by the creative, expressive style of the graphics,” he says. He admits to having done some illicit “bus-hopping graffiti” while growing up in California, but he never got in serious trouble. By the time, he moved with his family to New Jersey in 1992, he was hooked. The family first lived in rural Ringwood, where there was no graffiti scene. In 2009, Rainbow received a commission from Ellarslie, the Trenton City Museum, to do a mural in one of its galleries. The walls were covered with Masonite sheets and the windows and moldings taped off. Rainbow worked for 10 hours a day for four days, producing an autobiographical mural that begins with a baby in a spray can. “It’s saying that I was born to do this,” he says. Then there’s a boy on a tricycle and a lot of dream imagery. In the center is Leon’s face, with half a skull exposed, a reference to a dangerous drug period he went through in his early 20s. In the adult phase, he is painting, sitting on a stack of books and teaching. He teaches several workshops with the Trenton After-School Program. A rowing ghost by the elusive graffiti artist known as Banksy. This past fall, the British graffiti artist Banksy did a month of illicit pieces in New York City. The anonymous prankster used stencils to create witty tableaux on the sides of buildings. He painted a lovelorn swain holding a bouquet of wilted flowers on the door of the Hustler Club. By adding the silhouettes of two women in traditional Japanese dress, he turned a crumbling arch on a building facade into a charming garden footbridge. The addition of a little boy swinging a big hammer turned a standpipe with a fire alarm bell into a test-your-strength carnival game. Banksy is said to be the world’s most popular artist. People chip his images off buildings and sell them at auction. But he wasn’t popular with the New York graffiti artists, some of whom criticized him because he uses stencils. Others resented the public relations hype that always seems to accompany his productions. Rainbow understands the criticisms. He says he admires Banksy’s planning and his clever, site-specific visual jokes, but doesn’t consider him “a real graffiti artist.” Traditional graffiti, he says, is centered on a person’s name. That’s been the American version for sure. But probably there are others who say graffiti requires that risk factor—it has to be done in defiance of authority so the very act of doing it is a form of protest. But what makes contemporary graffiti interesting is the way it’s always reinventing itself. And manifesting itself in different cultures. When the Berlin Wall was pushed down in 1989, it was already covered with protest graffiti. In Egypt, revolutionary graffiti on buildings and walls employs caricatures of Egypt’s ruling elite and heroic depictions of the demonstrators. Graffiti can often be a nuisance and, when lacking in artistic merit, nothing but a defacement. But it has vitality. It rarely aims over the public’s head, unlike the smug, elitist art sold to jet-setters at international art fairs. There can be worse aesthetic crimes than putting spray paint on a building facade. Columnist John Zeaman is a freelance art critic who writes regularly for The Record and Star-Ledger newspapers. His reviews of exhibits in New Jersey have garnered awards from the New Jersey Press Association, the Society of Professional Journalists (New Jersey chapter) and the Manhattan-based Society of Silurians, the nation’s oldest press club. He is the author of Dog Walks Man, (Lyons Press, September 2010) about art, landscape and dog walking.